Considering how many people are obsessed with the UK’s Love Island and all the drama it brings, it’s hard to imagine there’s a version that’s even more chaotic. Enter: Love Island Australia. Love Island Australia is supposedly out of control in comparison to the UK version, and while a huge number of people dedicate their lives to the UK contestants each night, apparently the Australian version is even better than ours. Like Love Island UK, Love Island Australia film in Majorca. Unlike Love Island UK, the Australian cast are open to having a brawl in the villa. Despite the raging levels of drama Rosie, Megan, Adam and the rest of the UK contestants bring us every night, Love Island Australia have managed to fight their way – literally – to the top of the drama scale. While our elimination processes saw Charlie and Hayley refusing to sit next to each other on This Morning, the Aussies decided to show their anger in more physical ways. 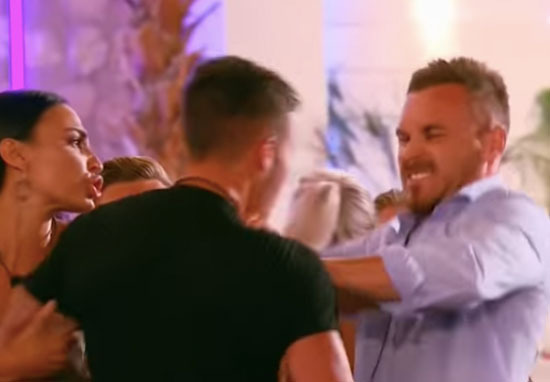 Footage from the show sees two of Love Island Australia’s contestants, Eden Dally and Grant Crapp, getting into a fight after they had to say goodbye to one of their fellow islanders. Eden and his partner Erin chose to eliminate Justin Lacko, but their decision was labelled as ‘unforgiveable’ by some of the other contestants, Tayla and Millie. Eden got angry that the girls disagreed with their choice, which in turn angered Tayla’s partner Grant. The tension became uncontrollable, and a fight broke out between Eden and Grant. Although slightly confusing for someone who has little context around the situation, the fight is still entertaining to watch, and definitely adds some excitement that Love Island UK is missing. Fans of the show have been comparing the UK version to Australia’s, some even making the swap in favour of the Aussies. Love Island Australia is honestly so much better right now. A girl just recouped with her ex partner just so he’d have to sleep outside with his new partner. Yesterday they had a fist fight. They have two villa cats. Why did I ever waste my time on Love Island UK when there’s constant savagery in Love Island Australia wow ??‍♀️? A new fave!!! Eden later admitted that the fight was a ‘stupid thing’ to have happened. Just when you thought Love Island couldn’t get any more dramatic, the Australians come along. Love Island UK could be in line for some shock of its own as ITV2 bosses are reportedly desperate to get contestant Charlie Frederick back in the villa after he was voted out of the show on Friday. An insider spoke to The Sun about the potential comeback of the professional model. Charlie was a hit with viewers and behind the scenes everyone thinks it’s really unfortunate he had to leave. There’s been a lot of talk about how he could possibly make a comeback – just like Mike Thalassitis did in last year’s series. What they don’t want to happen is make it predictable though, so if Charlie does come back to the villa it’s going to be in an explosive way. Bosses know what the public want and they have listened. Watch this space when it comes to Charlie. Charlie believed he had been voted out of the villa because of his coupling with Hayley Hughes, although Hayley told him he was ‘bitter’ and short sighted if he thought that being partnered with another girl would have stopped his eviction. I wonder if Charlie’s return would cause anyone to throw punches in the UK’s villa?